Killing weeds requires early detection, correct identification and the use of the right herbicide. The best way to control weeds is to maintain a thick, healthy stand of grass. Weeds are successful aggressors when lawns are vulnerable because of disease, insect damage, improper watering or soil compaction. However, even with ideal lawn care, some clever weeds will penetrate and spread in your grass. These weeds require digging or herbicidal treatment to remove them. Grassy weeds are monocots (single-seed leaf). They have hollow stems with parallel veins. Some grassy weeds have small, nondescript flowers. They may be summer annuals, such as crabgrass; winter annuals, like bluegrass; or perennials, including bahiagrass and dallisgrass. Control of grassy weeds begins with pre-emergent herbicides distributed with a broadcast spreader when weeds are dormant. Pre-emergent herbicides do not work on green weeds. To get good coverage with a granular product, use half of the product while walking in one direction with the spreader and then apply the remaining herbicide while walking a perpendicular path. Water after applying a pre-emergent herbicide and clean the spreader. Oklahoma State University extension service recommends applying postemergent herbicides as soon as possible after the weeds are visible. Most postemergent herbicides contain 2,4-D as their active ingredient. It is important to correctly identify the type of grassy weed and then apply only postemergent herbicides labeled to be effective for that type of weed. Also, make sure that the herbicide selected is approved for use on the type of grass in your lawn. Broadleaf weeds are dicots (two-leaf seeds) with rounded stems. If the plant has flowers, they may be showy with petals in groups of four or five, or in clusters. 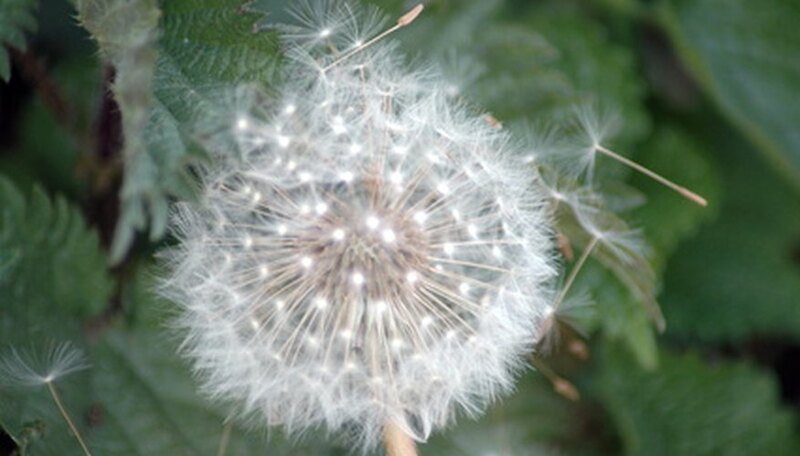 The dandelion is a typical example of a broadleaf weed. Other common broadleaf weeds are henbit, Carolina geranium, chickweed and clover. Pre-emergent herbicides are successful in controlling many broadleaf weeds that spread through seeds. To treat emerged broadleaf weeds, choose an appropriate herbicide--one recommended for that type of weed--and distribute by broadcasting with a spreader or spot treating areas. Small or scattered infestations are best controlled by spot applications. If using a spreader, follow the same instructions as those for distributing pre-emergent grandular herbicides. Broadleaf weed killers containing 2,4-d, mcpp, dicamba and carfentrazone are effective on broadleaf weeds. Before using a postemergent herbicide for broadleaf weed control, it is important to identify the weed(s) that you are attempting to control because not all weed species are controlled via the use of a single herbicide. Also, make sure your chosen postemergent herbicide is approved for use on your type of grass. Sedges are a sub-group of broadleaf weeds. They may look like grassy weeds, but their stems are triangular and not hollow. These plants are difficult to kill because they have underground tubers--sometimes hundreds of them--that are not reached by common herbicides. Lawn sedges include nutsedge, purple sedge, yellow sedge, green klinga, and globe sedge. Metolachlor may be applied as an effective pre-emergent at 8 to 10 week intervals before green foliage appears. Imazaquin will also control purple nutsedge, but can injure many landscape plants including azaleas and ligustrum. To treat after emergence, try Basagran TO. If this fails to kill the sedge, you may apply a glyphosate, which kills all plants in the treated area. NC State University: "Controlling Sedges in Landscape Plantings"